Sloanbook: I got a gym pass! So I got a gym pass about a month ago and am loving it so far! So far I've gone 5 times every week and I love all of the classes! I did my research and tried out all of the gyms and found out the best gym for me. 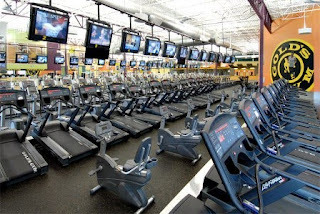 24 Hour Fitness-I got a week pass here and liked it a lot. I went to a Pilates class, Hip Hop Hustle class, Cycling, and Power Pump (lifting class). It was nice and not very crowded which was good. However there is only 1 location in the area and they barely have any class times (which I love going to). AND I know like 2 people who have memberships there. Gold's Gym- WINNER! I got a pass here and I LOVE IT. I have gone to Yoga, Turbo Kickboxing (which is one of my favorites), Intro to Cycling, Cycling, Power Pump (lifting class), and Zumba. I know a lot more people who go there (over 15) and recently I've gone a lot with Camri and sometimes Amanda! So it has been fun. Whenever Camri & I workout, we have puppy play dates. She has a little white fluffy dog named Marley and Katinka & Marley play either at my condo or hers and it is hilarious. When she asks Marley if she wants to play with Katinka, her ears perk up and she starts jumping around-- Katinka is not like that haha. She doesn't know her friends names. Oh well! It is very cute though. AND I brought in a coupon so that when I got a membership we got free tickets to the Utah Jazz game. We haven't gone yet but we can go anytime this month or the next! So that is always sweet. If anyone ever wants to go let me know! I go almost every day!